Our artist of the week is Kyriakos (Domenikos) Theotokopoulos. He was born on the island of Crete off the coast of Greece, but he spent most of his life in Spain. Luckily, he is known to all by his Spanish name, El Greco – which means “the Greek”. El Greco was a painter, sculptor, and architect of the Spanish Renaissance. His paintings were created during the late 1500’s. ​El Greco is most famous for his religious paintings, but he also painted portraits of his patrons and friends. He is recognized as one of the great geniuses of Western art. Our painting of the week is Saint Martin and the Beggar. Around the age of 20, El Greco went to Venice where he studied under Titian, the greatest painter of the time. El Greco received no big commissions while in Italy, so he moved to Spain. 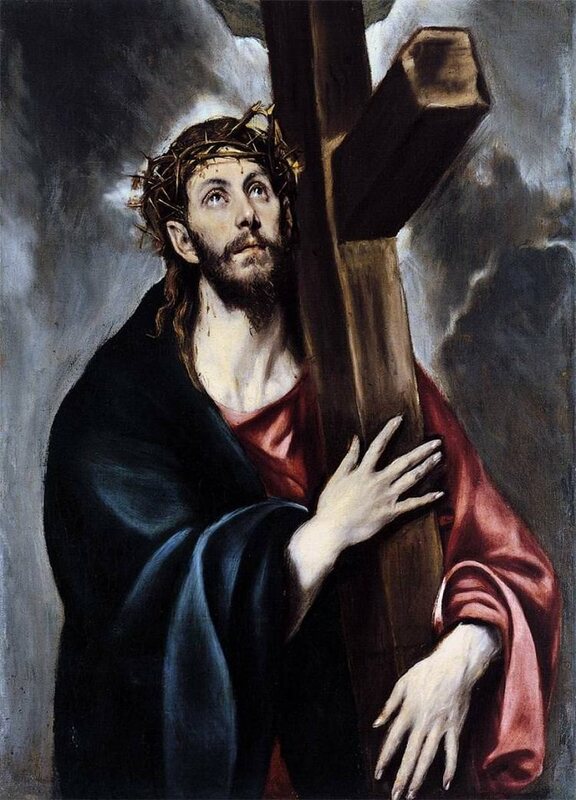 While living in Toledo, Spain, El Greco completed some of his greatest works. His painting, Saint Martin and the Beggar​, was commissioned for a chapel there. Saint Martin was a member of the Roman cavalry stationed in France. Coming upon a shivering beggar near the city gates on a cold winter day, the young soldier cut his cloak in half with his sword and shared it with the man. Tradition has it that Christ later appeared to Martin in a dream wearing the makeshift cape, saying, “What thou hast done for that poor man, thou hast done for me.” El Greco portrayed the fourth-century saint as a young nobleman wearing armor of that current time period. He rides a white Arabian horse. We see the men and horse from a low vantage point, making the figures seem larger, as if they loom over the landscape. The city seen in the distance is Toledo. The beggar’s elongated and distorted form was done on purpose, probably to suggest he was not of this world but could have been Christ himself. Although El Greco was a Greek, he is known for the works he painted while in Toledo, Spain. His painting, View of Toledo, is among the best known depictions of the sky in art. It features sharp color contrast between the sky and the hills below. El Greco chose to portray the scene just at that moment before a storm bursts. The heavens are at war, with the sun just holding out against the coming thunderstorm, and the atmosphere is electric. He placed the spire of Toledo Cathedral where it actually wasn’t located to better emphasize it. His painting shows key features, emotion, and the spirit of the place rather than precise details. A landscape is a painting of an outdoor scene. Landscapes were rare among Spanish paintings during the older periods. This made El Greco the first landscaper in the history of Spanish art. 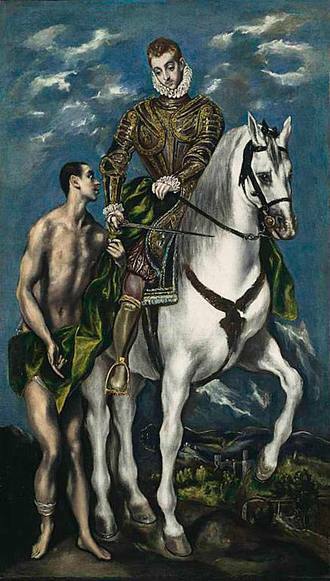 One of El Greco’s most famous works is The Burial of Count Orgaz which is about 16 by 12 feet in size. El Greco was successful in Toledo, but his art was not fully appreciated until long after his death. He was called a madman and a mystic. Some falsely believed that poor eyesight caused him to distort the figures in his paintings. The myths and mysteries surrounding him began to disappear when an important critic published a biography of El Greco in 1908. Since then, El Greco has taken his rightful place among the world's greatest painters.